I have a confession: the acclaimed Raazi, about a young woman, Sehmat, who marries into a Pakistani family circa 1971 so she can spy for India, left me a little cold. Sensitive and well-intentioned though the film was, I thought it inertly paced, lacking impetus – even when it moved towards what was meant to be a dramatic climax. The story did work on some levels: it can be read as a commentary on marriage as a pact that involves moving out of one’s comfort zone into a new space (and as a ticking time-bomb that can blow up in everyone’s face, even when no one is to blame). But the espionage angle fell flat for me. Perhaps distracted by the solemnity with which the film treats Sehmat’s spying, I began picturing the suspicious old family servant Abdul (played by Arif Zakaria) as a Pakistani version of Rebecca’s Mrs Danvers, swishing about in a black gown, holding candles. My mind also turned to other, madcap treatments of the spying theme. The “Spy vs Spy” comic strip. Austin Powers. Peter Sellers’s Inspector Clousseau pretending to be a telephone repairman (nobody is fooled) and asking, in a heavy French accent, to see the defective “fern”. That also makes Peechha Karro sound like a more organized film than it wants to be. 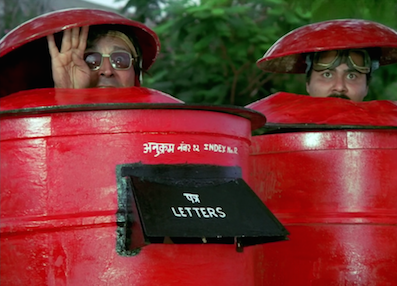 This is essentially an assortment of comic sketches – some inspired, others that play like school-level skits – held together by the shenanigans of Ravi Baswani and Satish Shah as two policemen who say things like “Desh ko tum pe naaz hai” (“Your country is proud of you”) in such bizarre situations that even Raazi’s heroine might consider becoming a defector. The result being a hit-and-miss film with some unoriginal lowbrow humour (a Chinese-looking martial-arts expert is called “Choos Lee, son of Guth Lee”) and a few unnecessarily stretched-out scenes, I can’t recommend it as a whole. What I would propose, though, is a highlights package: a list of the funnier moments where everyone involved seems to be having a good time. 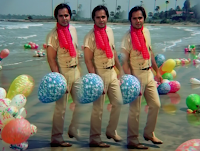 For instance, even viewers who aren’t fans of the Rajendra Nath school of comedy should enjoy the aging actor’s performance as Vijay’s father, who quotes Hindi-film lyrics but attributes them to mythological figures. “Yamraj ne Savitri se kaha tha: jeena yahaan, marna yahaan, isske siva jaana kahaan? (The God of Death told Savitri: we live and die here, where else can we go? )” he says with a wise and faraway look. There are some nice little scenes like the one where Vijay – hoping to renege on his duties and go on a honeymoon instead – is confronted by his stern-looking zameer (conscience), who orders him to be a patriot. “Agar desh bachega, toh Kashmir bachega aur tum sainkron honeymoon mana sakoge.” (“If the country is saved, Kashmir will be saved and you can go on as many honeymoons as you like.”) In its more ponderous stretches, Raazi could have done with a dream-interlude of this sort. But at other time, it also straight-facedly employs those clichés it. And sometimes, you can’t tell when it is doing what: there are romantic song sequences that appear to exist mainly so Farooq Sheikh gets a chance to have some of the fun that was denied to him in more sombre roles; to wear bright shirts and shake his hips like Jeetendra. Some fun is had with other star personas too. Since the Brigadier is played by Amjad Khan – forever immortalized as Sholay’s fearsome Gabbar Singh – this film can’t resist a nod to Gabbar’s “Kitne aadmi thay” entrance scene. And you have to sympathize with Vijay here: being damaad to such a man must be as scary for him as it is for Ben Stiller in Meet the Parents to discover that his future dad-in-law is a grimacing Robert de Niro, looking like Al Capone in The Untouchables, baseball bat in hand. 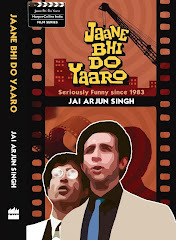 Peechha Karro belongs to a moment in mid-1980s cinema when a very particular brand of crazy humour was in the air. The signpost of this mini-zeitgeist was, of course, Jaane bhi do Yaaro, but other such works include Mohan Joshi Haazir Ho (a pedantic social-message film with some eye-popping scenes featuring Amjad Khan – again – as a heartless landlord, and Pankaj Kapur as a sinisterly poker-faced “promoter”) and Khamosh (a thriller that was also a cheeky commentary on filmmaking). Their knowingly over-the-top tone was sometimes difficult to identify as such because so many of the regular films of the time were (unintentionally) over the top anyway. To explain Peechha Karro and those other films, you may have to posit that the crew were on the hallucinogenic substances that the Brigadier smuggles in sweets – delivered only after he has squawked code messages like “Miaow! Miaow! Kuttay ko billi ka salaam!” (“The cat salutes the dog!”) Or it could be that the technology of the period – such as unwieldy rotary-dial phones – naturally inspired funny situations in the spying context. “Telephone exchange ho gaya,” is the punch-line after a phone inadvertently gets tossed around in Peechha Karro; it’s a reminder of the famous slapstick scene involving Naseeruddin Shah, Satish Kaushik and two telephones in JBDY, but it also made me think of Sehmat setting up complicated bugging devices in her bathroom (with Abdul Danvers keeping an eye on her from the next room), and what those scenes might have looked like in a different sort of film.